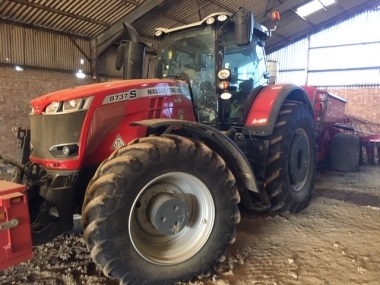 Massey Ferguson 8480 tractor model with Dyna-VT constantly variable transmission. Find below information on the specification and options available on the MF8480 tractor model. The MF8480 came as standard with the Dyna-VT constantly variable transmission, at 315 hp and 1280 Nm of torque the MF 8480 was the flagship model in the MF 8400 range of tractors. Available with options of full electric fingertip control spool valves, DATA 3 tractor management system for full headland control and Autoguide automatic steering. Massey Ferguson 8480 tractor model information. The Massey Ferguson 8480 tractor was the highest hp Massey Ferguson tractor produced in the range, and as such was the most commonly sold model out of the MF8400 series of tractors. Replacing the MF8200 series of tractors with the powershift transmission, the revolutionary Dyna-VT transmission fitted to the MF8480 was not only 100 % smooth, from 0-50kph but also allowed exactly the right transmission ratio to achieve the optimum forward speed while being able to reduce engine revs to the minumum required for the task, in doing so hugely reducing fuel consupmtion. 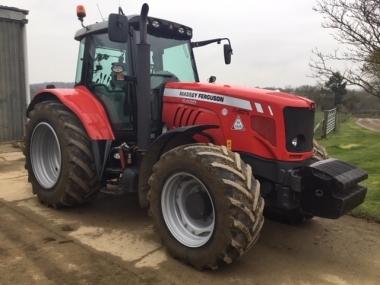 The Massey Ferguson 8480 was fitted with the Sisu 8.4 litre 6 cylinder intercooled turbo diesel, producing 290 hp at rated engine revs, and 315hp at peak power, accessable throughout the range of forward speeds from the Dyna-VT transmission without the need for boost. The Dyna-VT transmission borrowed from the AGCO sister company Fendt, (and produced in the same German factory), made the tractor ideally suited to work in the vegetable, root crop and transport/grassland sectors, where forward speed is crucial to the quality of the work achieved. The driving style remained common to all other Massey Ferguson tractors, with a left hand 'Powershuttle' for clutch setting off, transmission ratio change and forward and reverse, and crucially did not require the use of complex screens and settings to be able to drive the tractor. Although not required for standard tractor operations most users of the Massey Fergsuon 8480 tractor, typically specified it with the excellent DATA3 full colour terminal, that allowed fully integration of headland mangement sequences, and Autoguide self steering when equipped with the B4 TopDock from Beeline - all operated through one simple easy to use terminal. 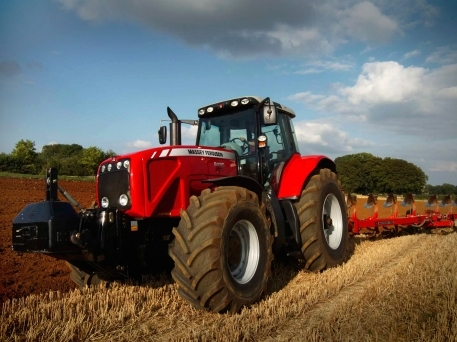 The majority of Massey Ferguson 8480 tractors were fitted as standard with automatic climate control, deluxe air suspended Grammer seat, SMS electronic spool valves, dual stage pneumatic cab suspension & in cab selectable PTO speeds. Some were also equipped with factory fitted front linkages and these tractors were also usually supplied with rear wheel weights for heavy draft cultivation. 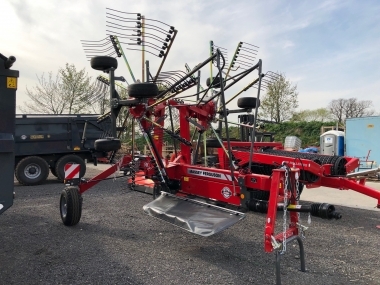 Launched in 2005, the MF8480 was available in either 40kph (with a non-suspended front axle), or 50kph version, which came with the reliable and comfortable Quadlink front axle suspension. In this specification the tractor had a base weight of 9,400kg and typically with front and rear ballast would come in at about 10,750kg when set up for heavy draft cultivation. The MF8480 was also commonly supplied to be used on the Massey Ferguson 190 Big Square 'Heston' Baler. 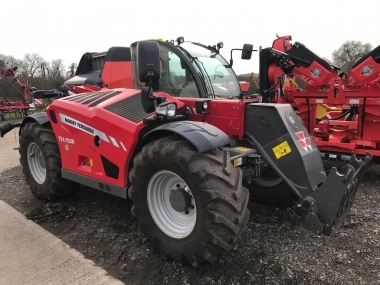 The high pto hp, Dyna-VT transmission and excellent in field comfort made this a high output combination, further improved with the launch of the Massey Ferguson 2190 baler with even higher output, and benefiting from the 280 + hp the MF8480 produced at the PTO shaft. 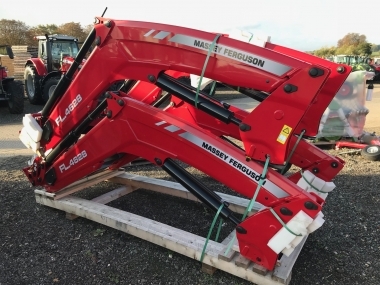 Supplied as standard with a 5 year MF manufacturers warranty (generally up to 2,400hrs max - although this was adjusted to suit the owners expected usage), the Massey Ferguson 8480 tractors you will find today for sale have typically benefited from a full MF factory dealer service. This has assisted their reputation as strong reliable high hp tractors. buy every original 8480 part online.